When folk first start navigating, they use handrail features all the time. Handrails are linear features such as paths, fences or streams. They are excellent navigational aids providing safe routes between points. You simply follow the feature without having to keep looking at the map or compass. When you are homing in on a small target such as the tent or snow hole you plan to spend the night in you want to maximise your chances of finding it first time. To do this it is good to identify a well defined feature near your target and use this as a starting or attack point to find your objective. By approaching your destination like this, if you do not find it first time you can easily return to your known attack point and start again. It is foolish to always aim directly at an objective when walking on a bearing in poor visibility as it is highly likely that errors will creep in and you will end up to one side or the other of the target. In this case you will not know which side you are on so it will be guess work to locate the objective. Aiming off describes the technique of purposefully taking a bearing to one side and is commonly used when the objective is a linear feature such as a a stream, path, wall or ridge. Where a hazard exists which presents a real danger - such as a cliff, cornice, avalanche prone slope or snow covered water for example - then you need a foolproof method of walking around it without losing your overall sense of direction. Doglegs or boxing are two easy techniques for doing this. By doing a dogleg you simply go along two sides of a triangle rather than along the single long side. This will mean that you have travelled further, but the method will take you clear of the unseen hazard you identified on the map that was presenting a risk. Boxing is used when you have to avoid a hazard when walking on a bearing. Instead of following a straight line route you walk around three sides of a box as shown in the illustration. By walking to the side at 90 degrees all you have to do is turn the compass until the needle is aligned with east (or west) without changing the important main bearing. Walk for a distance that is easy to remember (say 100m), continue on the main bearing for the desired distance, then turn west (or east) for 100m to be back on line again. The aspect of slope underfoot is often a really useful piece of information which helps you identify where you are. In whiteout conditions any sense of horizon is lost and it may be difficult to be sure whether you are travelling up down or across a slope. Rolling a snowball can help you identify the fall-line which is an imaginary line running straight down the hillside. On the map this line runs at 90 degrees to the contour lines. 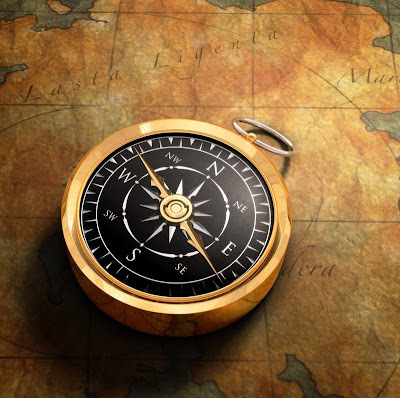 Establish the direction of the fall-line and take a compass bearing down it. Adjust this magnetic reading to a grid bearing and align the compass on the map until the edge is at 90 degrees to the contours. This technique does not give you an exact position, but it does provide an additional piece for the jigsaw by confirming which slope you are on.